Nancy Kuster is a second-grade teacher and recent graduate of the New Jersey Learns Program. After studying macro-invertebrates the second grade class went to Green Brook to determine the water quality - which turned out to be good based on the samples found living in it. They also made "up cycled" planters out of water bottles to grow milkweed from seed to attract Monarch butterflies. This is EfS in action. Beyond Recycling is an artist-in-residence program funded by MetLife and Young Audiences Arts for Learning. Teaching Artists, Eloise Bruce and Zach Green, worked with students in grades 6-8 over a 10-day period to develop an original musical theater piece for younger students about creating a sustainable earth. This project is an outgrowth of YANJ's work with New Jersey Learns (NJ Learns), a program that unites schools and communities to learn and change together to instigate, sustain, and scale up the innovations and best practices that contribute to sustainability and that characterize Education for Sustainability. Waste Not Card & Online Game - A card game in which players learn about keeping resources out of the landfill and using less energy in the cycling process. New Jersey Learns associate and Game Designer, Kirsten Bonanza, created Waste Not because it drives her crazy to have to throw things away. The game itself as a way to explain the possible options available when an object is no longer good for its inital use. The core question of the game - What are you going to do with it? - challenges players to rethink trash as potential and resources. Waste Not is being made available as a card game for in person play and as an online game. Kirsten's background is in teaching, facilitating, and consulting. Her interest in design lies in educating for sustainability and systems thinking. She also believes that we will achieve a sustainable future more easily by giving people the experience of how a large system (Earth) works in a playful environment. After Kirsten realized that she'd begun work on her 10th idea for a game, that while her heart calls out to teach and work with Entrepreneurs on building their organizations, it is obvious that Game Design is no longer just a hobby or tool for her own personal use. With her company Create Better Impact Games, Kirsten seeks to do just that - create better impact on the world. In a profession where the goal is to plan better communities it seemed to me that we were going about things the same way we had been for decades. Sure, over time the focus shifted away from sprawling communities and toward “smart growth” – building homes near major transportation corridors, protecting the environs. But, there had to be something more… a better way, still, to create more livable communities and communities that thrive, not just survive. When I was introduced to the NJ Learns program, I was interested because I had an interest in the topic of sustainability. It has been called the largest social movement this planet has ever seen – only you don’t actually “see” it happening. Millions of people all over the world in town halls, school libraries, and community centers are getting together to implement their visions for change. They’re organizing events to inform their local officials and the community-at-large. It’s a movement alright, and I wanted to learn how to better communicate the concept. I learned more than that! Participating in the NJ Learns program, I had many “aha” moments. From learning how to teach the concepts about and the data for sustainability to a better understanding of how people perceive sustainability and their concerns for changing behavior, I could see how the shift would not only have to come from the community, but that the local leaders would have to set the example. The lone planner in a room full of educators, I began to see how educating my audience would be a little different since I am not a teacher, per se, but that it could be just as powerful. Now, every time I walk into a planning board meeting the topic of sustainability is on my mind and is communicated through my work. These mentalities translate right into our communities and it is hard for residents and local leaders to see the benefits, when it is such incremental change. There are a few popular phrases in local government that tend to set the tone for creating sustainability strategies. One is “How can we get the biggest bang for our buck?” Local leaders want to do right by their taxpayers, providing quality of life, but they don’t want to enforce practices that may cost money. The other is “Let’s look at the low-hanging fruit.” This is a good strategy for getting something off the ground. It is a quick way to get a project done and shows that the local leadership is doing something for the community. It also provides momentum for a larger-scale project that may take more time. However, it often doesn’t take into account the bigger picture. The topic of sustainability is a tough web to untangle and make sense of. Land use planners are typically the ones to break down these issues and present them in a meaningful way so that local leaders can make decisions. Planners guide the development of ordinances, policies, and regulations, at the same time, supporting community-wide campaigns for residents to become more aware of how they can green their lifestyles. If all planners were speaking a shared language of planning for sustainability, we could create a paradigm shift toward sustainability and livable communities from the top-down and the bottom-up. My NJ Learns training and practice of the program continues every day I am working to create more livable communities in NJ. NJ Learns | From Action to Thinking and Back Again! When I first learned of the NJ LEARNS Educating for Sustainability opportunity, we were well on our way to making changes in West Milford. We had established a nonprofit called Sustainable West Milford and grown our membership from 6 to over 400 people in just one year. We had a variety of action-oriented and educational programs including: monthly educational presentations; “Buy Local” campaigns; an organic community garden: and an annual GreenFest. We were excited with the prospect of learning more, getting some new tools, and making some connections with other groups around the state to help move our efforts forward. The NJ Learns program delivered all that and more. I was in the first year of the training, and even continued my training for a second year! Not that I’m all that remedial, (well, maybe a little!) , but that fact is, I learned even more in the second year. And more importantly, I learned different things that have shaped the way I think about sustainability. After the first year of Educating for Sustainability (EfS), my focus was on using the wonderful tools and information provided to better engage community members and convince them of the need to change their actions, for as Jaimie Cloud points out, “everything you do or DON’T do, makes a difference.” After the second year of the EfS training, I have become keenly aware of the need to change the thinking of our community in order to change their actions. Often during presentations on sustainability, I am asked to describe what sustainability “looks like” in the community or in a school. My old answer used to include the usual suspects – they recycle, use renewable energy, buy local, compost, etc. In short, promoting different actions. Now, my answer begins with “they think differently – and that thinking leads to different actions”. The old expression, “You can lead a horse to water, but you can’t make it drink” provides a wonderful analogy to describe our shift. We have done a great job of leading the horses (tons of information and reasons why we should be acting more sustainably) and providing the water (actual opportunities to act differently through our programs), but not all were drinking. Many were, and indeed, many more did with each additional opportunity we provided. For example, Sustainable West Milford’s Farmer’s Market initiative was so successful last year that we attracted 14,000 shoppers. That is 14,000 people promoting our local economy, local agriculture, and effectively acting more sustainably. Make no mistake: this strategy of changing community members’ actions by providing information and opportunities to make real changes has been extremely effective and essential in building momentum, exposure, and support, but like most strategies, it has its limitations. For one thing, it is not fast enough – our window for change is a narrow one, and for another, we can only do so much! So, this year, in addition to our action-oriented strategy, we introduced a companion strategy to address this need for a change in thinking. If community members change the way they think, they will lead themselves to make the choices that will result in a truly sustainable community. As Jaimie reminded us during our training, there is never just one reason for a problem and there is never just one solution! Livingston resident and volunteer Chris Bickel knows what it's like to go hungry. He spent eight months homeless as a teenager. Tim Farrell/ The Star-Ledger. ESSEX COUNTY — Want to donate more fresh food to your local pantry? Talk to Livingston resident Chris Bickel — he is working on an app for that. An active volunteer with local pantries and the first townwide Food Day coming up on Wednesday, Bickel is raising funds to build a mobile app that’s a new twist on old-fashioned giving to food banks. His app idea, which has gained traction with local pantries, basically creates a "virtual refrigerator" on your smart phone or tablet. The app makes it possible to donate money for healthful foods or actually select the foods — tomatoes, green beans, a dozen eggs. "The fresh stuff is really what’s going to make people feel better," he said. Eileen Sweeny, coordinator of Pantry Partners for United Way of Northern New Jersey, has been in talks with Bickel about developing the app and believes it will increase healthier options in pantries beyond Livingston. If the donor gives money, the donation will be sent directly to the designated pantry or soup kitchen for purchasing fresh food. If the donor purchases, say, two bags of apples or three heads of lettuce, it will be delivered directly to the designated charity by participating stores. Several grocers already have expressed interest, Bickel said. "I think it has enormous potential," said Sweeny, noting that three years ago United Way began its own push for more items like whole wheat pasta or low-sodium canned vegetables. "It could change what’s in food pantries and soup kitchens across the country." The app will also feature a dashboard that shows in real time what a charity’s greatest needs are using charts and graphs. Bickel said he needs to raise a few thousand dollars to get the app professionally developed. Livingston volunteer Chris Bickel knows what it's like to go hungry. He spent eight months homeless as a teenager. Bickel knows what it’s like to go hungry. Growing up in Ventnor, he was the second youngest of eight children in a household where food stamps put meals on the table. At 16, he was homeless for about eight months and was helped by an English teacher and his rowing coach. 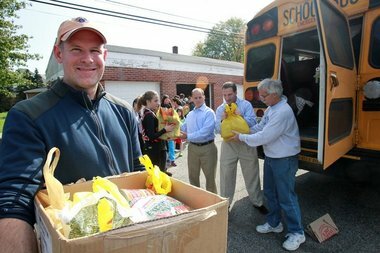 Now the supervisor of social studies for Livingston Public Schools, Bickel, 43, serves as the district’s liaison to the township’s Food Day Committee — which has organized events throughout the month to celebrate healthful food and raise hunger awareness — and has become one of its biggest advocates. On Oct. 14, volunteers including Bickel and the Community Hunger Outreach Warehouse filled a school bus full of donated goods for a series of "Stuff The Bus" events around Essex County. Many times, hunger is a silent problem in suburbia. "Sue," a 48-year-old Livingston resident, is one example. As a working single mom of three, she struggles to make ends meet and receives food from St. Philomena’s pantry. She did not want to give her name. The economy hit her family hard when her husband, whom she is separated from, had his salary cut in half. That, in turn, slashed the child support she receives. "My kids are happy with a box of pasta," she said, but as a mother she wants to give them more. "Food is definitely an expense, and I’m trying to make sure they get chicken and all the stuff that they should be getting." "The money they do have they’re using on taxes or their mortgage, and (residents) scrimp on food," said Sister Barbara Howard of St. Philomena’s, which has partnered with Bickel. And it’s not easy to rely on food pantries in a well-to-do town like Livingston. "We live in a town where people have two, three homes or vacation in Mexico every break or get a car on their 17th birthday," the single mom said. To contact Bickel or support his effort to create an app, send an e-mail message to bicman7@yahoo.com. As a member of the 2008 inaugural class of NJ Learns, forty other people and I from across the state spent a total of 8 days learning how to talk to my community about sustainability. Because of my role as community leader, in the years since, I’ve spent time crafting my own skill at sharing the concepts of Education for Sustainability more informally. In the last three years, I've used NJ Learns tools in my interactions with community members, elected officials, senior citizens, students and others. The variety of audiences to whom I’ve presented hasn’t just allowed me to tailor my presentation skills, it’s also been fundamental to creating a shared understanding about sustainability across these distinct audiences, opening pathways for me and for them to make more connections, find common interests and work together toward our shared goals. I graduated from the New Jersey Learns program in 2009. I didn’t know it then, but my understanding of sustainability as it related to environmental literacy would drastically change. I’ve moved away from compartmentalizing my ideas and actions, seeing instead their inter-connections and interdependence in a more fluid way. Now, I look for broader and higher level ideas and stewardship. For example, early on I co-chaired two large environmental fairs and a compact fluorescent bulb distribution in the township of Livingston, NJ. I thought each separate event was a success. I “checked” it off my list and told myself, “You are doing your part, Chris.” However, NJ Learns taught me to think “upstream” and go to the source of the problem. 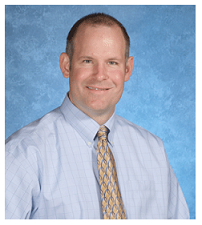 I decided to bring my learning back to my position as a Supervisor of Social Studies for grades K-12 in Livingston NJ. Getting the word out! Creating Awareness for A Sustainable future! After attending NJ Learns Training at the Cloud Institute last year, I was ecstatic to return to Cranford and begin inspiring students, staff and community members to educate for sustainability. My number one goal was to use what I had learned and share my experiences; I didn’t want to pass up this great opportunity for change. Luckily I was fortunate enough to be able to incorporate all three groups - students, staff and community members - into the NJ Learns practicum I needed to complete for my certification, which helped me to achieve my goal. The New Jersey Learns training has brought together 70 exceptional leaders representing 15 communities in New Jersey (including: Cherry Hill, West Milford, Elizabeth, Livingston, Far Hills, New Brunswick, Green Brook, Jersey City, Bayonne, Trenton and others). As we initially embarked on this journey, the Cloud Institute and our partners set forth that: We would open a program to community teams comprised of individuals who are interested in developing their community’s capacity to make the shift toward sustainability. By linking community efforts to K-12 Education for Sustainability we create a whole community learning environment for systemic change.